Heat networks in apartment blocks are inherently inefficient, research by AECOM (building performance evaluation of dwellings, 2015) has shown that centralised modern heating networks are highly inefficient and can lose up to 50% of the generated energy in distribution losses - particularly in buildings built to the current building regulations with very low heat loads. Last year approximately 1400 apartments were built in Ireland with high temperature heat networks installed, resulting in a potential of up to 4.2 GWh of energy wasted in those apartments every year - enough to provide an additional 1400 apartments with heating and hot water. The overall poor energy efficiency of these system, due to the high loses of the heat network, is particularly prevalent during the summer months as water needs to be circulated at high temperatures to maintain hot water supply. The high losses cause significant overheating in communal areas and corridors of these apartment blocks and separate ventilation measures often have to be provided as a way of dealing with the overheating. Glen Dimplex has developed the Zeroth Energy System to overcome these issues. 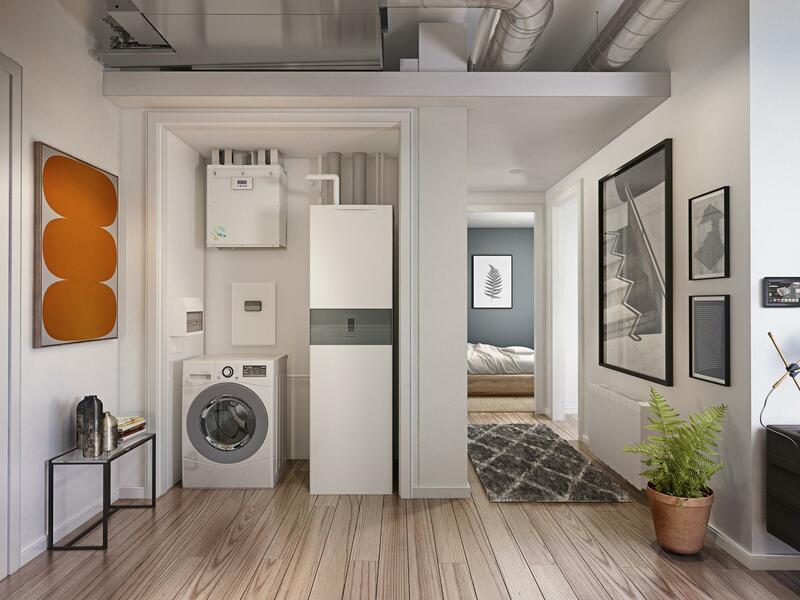 Zeroth replaces conventional high temperature systems with an ambient temperature, maintained by the building’s central plant room, which is set to revolutionise the way we heat and cool apartment buildings. Low temperate water flows around the building’s main loop at 15-25 degrees to each apartment. The energy input to this loop can be from local sources such as boilers, heat pumps, chillers, or from wider district networks such as power plants, data centres or other waste heat sources. Within each apartment they all have their own ‘mini loop’ where an individual heap pump produces heated or chilled water to the desired temperature. The water can then be passed to fan coils, which deliver warm or cool air into a room through vents in the ceiling or wall, or to underfloor heating or fan-assisted radiators. As this water in the heat network is at ambient temperatures loses can be as low as 2%. This results in more comfortable temperatures within apartments and reduced overheating in communal areas - both common challenges that face conventional heating and cooling systems within modern apartment blocks. What is more, the cost of heating system losses is no longer spread across all residents, meaning they only pay for the heating or cooling they use. The Zeroth system has a number of benefits in addition to the energy saving potential of low temperature heat networks, for example the improved comfort experienced by occupants particularly in the summer time avoiding apartment over-heating risk, reduced corridor temperatures, provision of heating hot water and cooling via a 2 pipe system offering capital savings over traditional 4 pipe systems, and no requirement for refrigerant pipe work or leak detection as everything is water based. Plant rooms are significantly smaller and the potential for modular design coupled with the fulfilment of the need for nZEB energy designs to meet the building regulations, results in the perfect solution for an ongoing issue. For more information on the Zeroth Energy System, please contact us on +353 1 842 4833 or salesireland@glendimplex.com.